Risk-based asset management focuses on prioritizing the most critical assets by evaluating their risk of failure. A typical way to determine the risk of failure is by assessing the asset’s likelihood of failure and its consequence of failure. 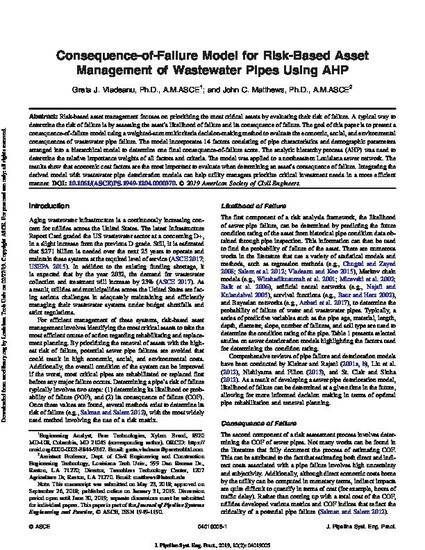 The goal of this paper is to present a consequence-of-failure model using a weighted-sum multicriteria decision-making method to evaluate the economic, social, and environmental consequences of wastewater pipe failure. The model incorporates 14 factors consisting of pipe characteristics and demographic parameters arranged into a hierarchical model to determine one final consequence-of-failure score. The analytic hierarchy process (AHP) was used to determine the relative importance weights of all factors and criteria. The model was applied to a northeastern Louisiana sewer network. The results show that economic cost factors are the most important to evaluate when determining an asset’s consequence of failure. Integrating the derived model with wastewater pipe deterioration models can help utility managers prioritize critical investment needs in a more efficient manner.